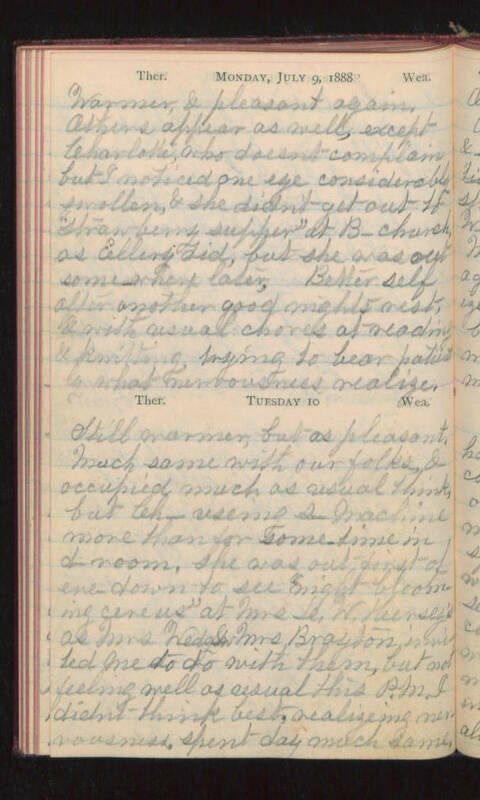 Monday, July 9, 1888 Warmer, & pleasant again. Others appear as well, except Charlotte, who doesn't complain but I noticed one eye considerably swollen, & she didn't get out to "strawberry supper" at B- church as Ellery did, but she was out some where later. Better self after another good nights rest, & with usual chores at reading & knitting trying to bear patiently what nervousness realize. Tuesday 10 Still warmer, but as pleasant. Much same with our folks, & occupied much as usual think, but Ch- using s-machine more than for some time in d-room. She was out first of eve - down to see "night blooming cereus" at Mrs L. W. Kersey's as Mrs Wedgew, Mrs Brayton invited me to do with them, but not feeling well as usual this PM. I didn't think best, realizing nervousness, spent day much same.